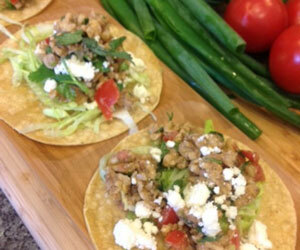 These tacos may be one of the best recipes for fooling your taste buds! It pretty much breaks the laws of tasting physics, because we transform raw walnuts into… taco meat! The walnuts are covered in spices so they taste and resemble ground beef. 1. Preheat oven to 375 degrees and line a sheet pan with parchment, set aside. In a bowl chop and stir together, the tomatoes, scallion, cilantro, lime juice, remaining teaspoon olive oil, and stir again, set aside. Shred the lettuce and crumble the feta cheese, set aside. 2. Prepare the taco filling by pulse chopping in a food processor the walnuts, cumin, chili powder, salt, and olive oil into about ¼ inch pieces. (Walnuts can be chopped by hand and olive oil and spices stirred in.) Pour onto the parchment lined sheet pan and bake for 6 minutes until toasted. Remove from the oven and set aside until ready to assemble tacos.